Creating a farmhouse guest bath can be done using a standard vanity, sink, and faucet as a foundation. The keys to getting the farmhouse look are to add natural wood, beadboard walls, natural-colored stone tile, and wood molding trim to give the space personality... a farmhouse personality. Then add country accessories. 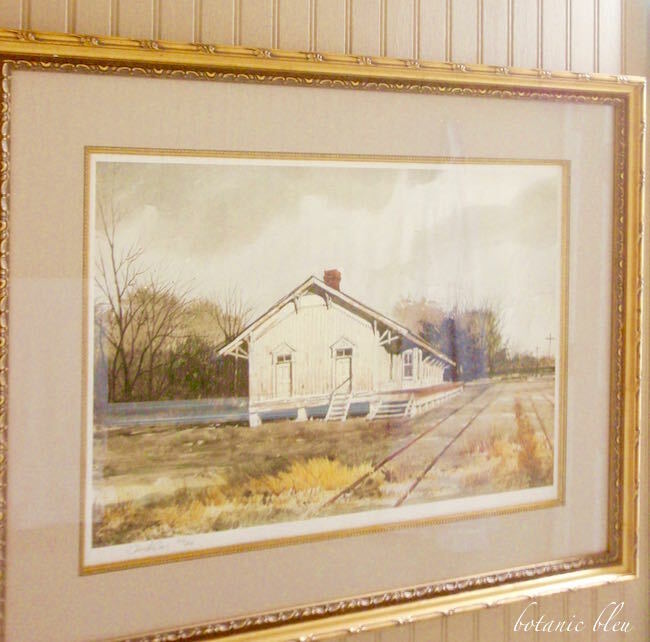 A large scale print of an old abandoned country train station in a rural setting nails the farmhouse look. Brown paint with white molding are just the beginning of the farmhouse style in this guest bathroom in my brother's house in rural Alabama. Standard fixtures with a white shower curtain, white wood rail trim, and a white cultured marble vanity top give the bathroom a fresh simple look that is classical farmhouse style. Readily available products make it easy for anyone to duplicate the look without breaking the bank. 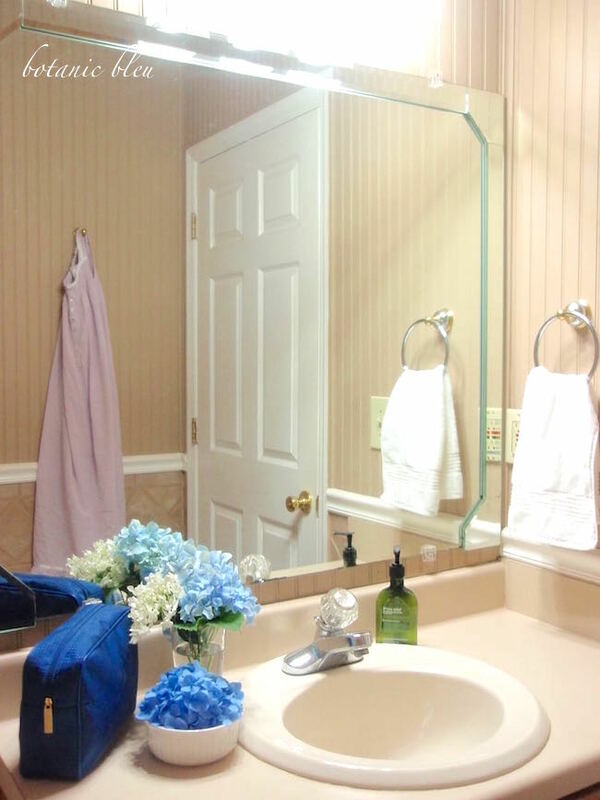 The bathroom could have taken a different style by using a different print on the beadboard wall. For instance, a large floral print would have given the room a Victorian look. A single hook on the wall opposite the sink is a great place to hang a towel or my favorite cotton nightgown. A high nine-foot ceiling covered in natural wood says farmhouse, farmhouse, farmhouse! Before air conditioning high ceilings helped keep rooms cooler since hot air rises. The crown molding with corner trim work adds even more to the farmhouse conversation going on in this room. Nothing says American farmhouse more than fresh flowers from the yard. 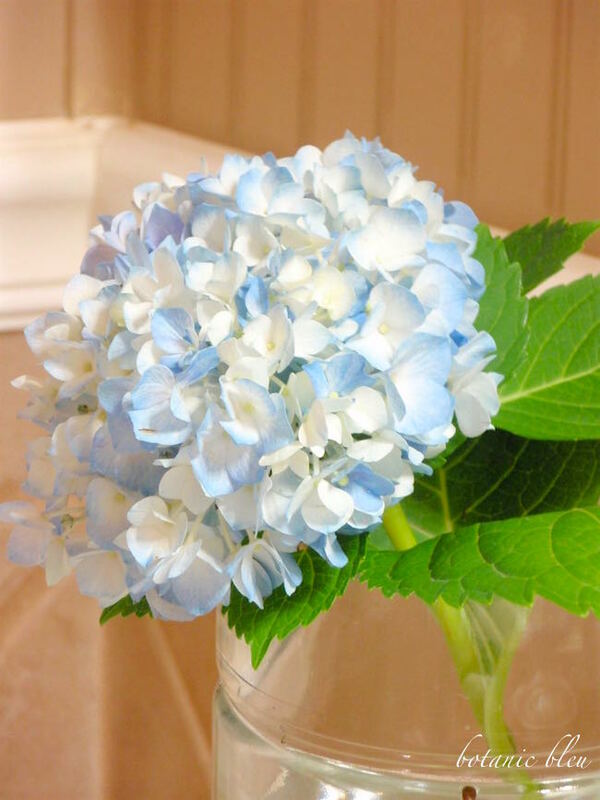 And no other flower says Deep South farmhouse more than blue hydrangeas. And what better way than fresh flowers says welcome to guests? 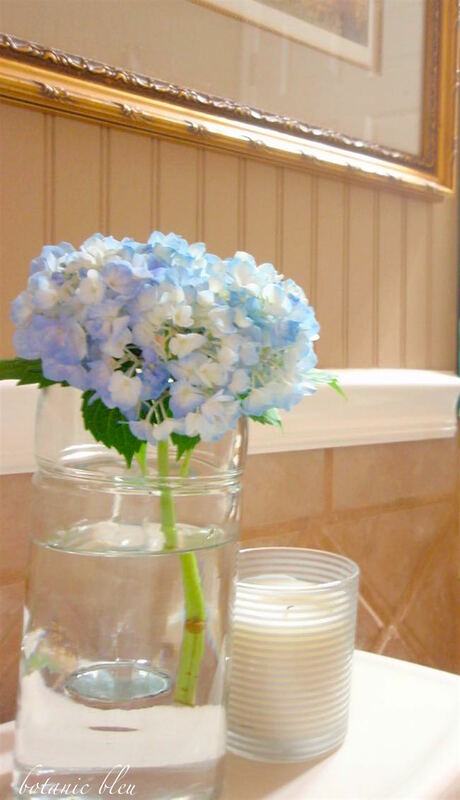 Soft brown wood and tile are perfect neutral backgrounds that allow any color as an accent, but the blue and white hydrangea petals are my favorite accent colors for this room. 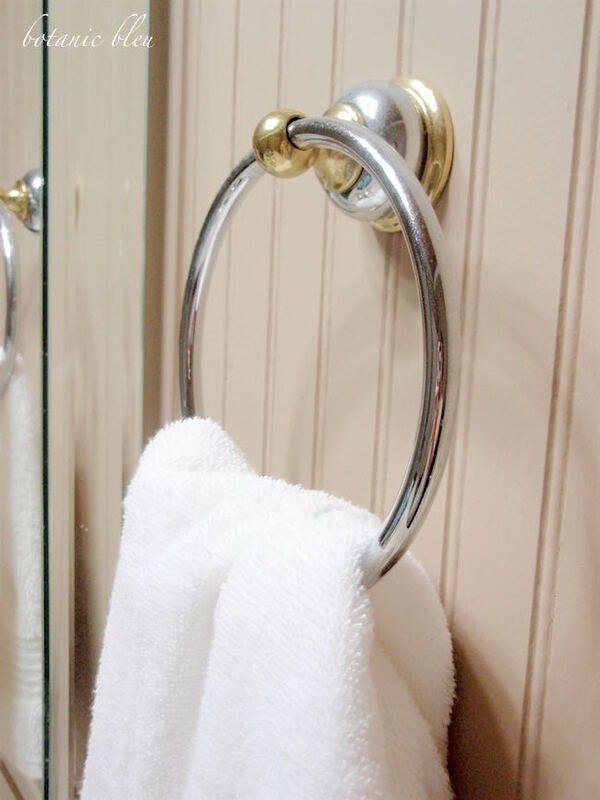 Fresh white towels hanging from chrome and brass towel holders are more farmhouse accents. For years my grandmother and mother only had white towels and sheets since that was the only color available. As I drift to sleep in my brother's farmhouse, set in a pasture surrounded by grazing cows, I can hear the mournful sound of a freight train whistle as it rolls along the nearby railroad track. Hydrangeas do it every time for me! 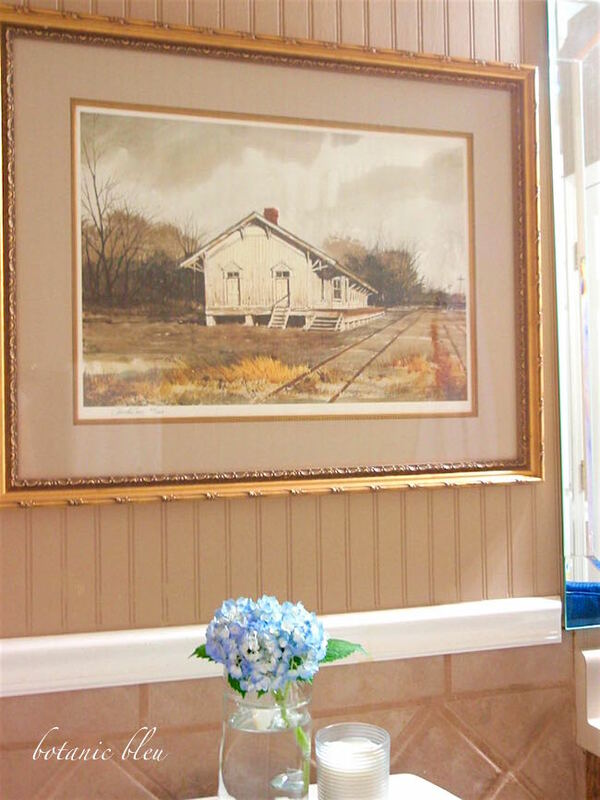 I wanted to paint the kitchen this year AND add white beadboard to one section of the small breakfast nook, but it looks as if that project has to wait! 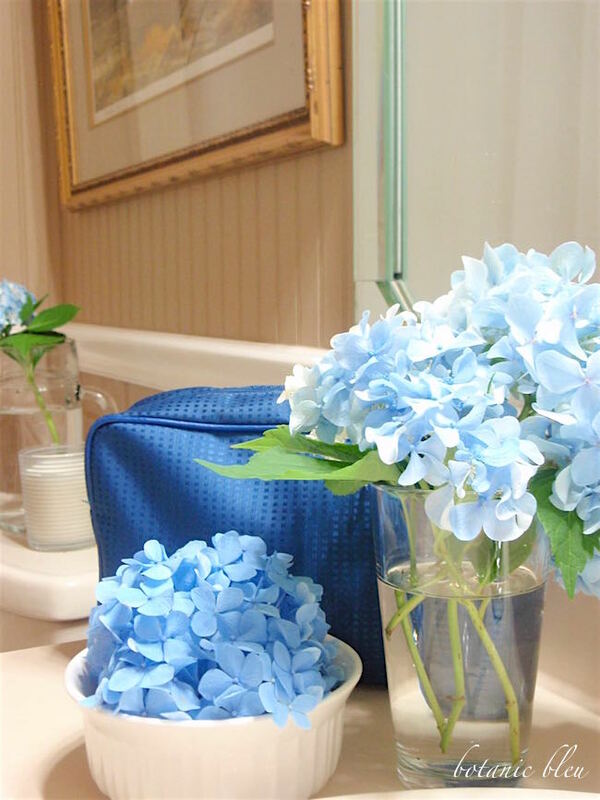 Blue hydrangeas and white towels- what's not to love? Very lovely! Adore the bead board! I love bead board and have it in our hallway and in the dining area, but below the chair rail. Bead board above the rail gives the room an entirely fresh look. I'm going to have to try that here because I love your brother's bathroom. The color combinations are especially appealing! 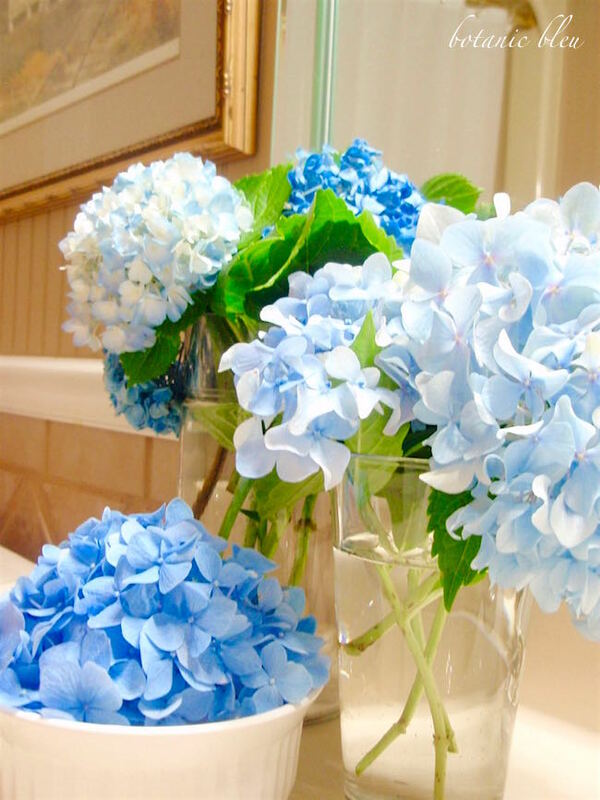 Love the Hydrangeas and your signature blue so fitting. Love love beadboard. 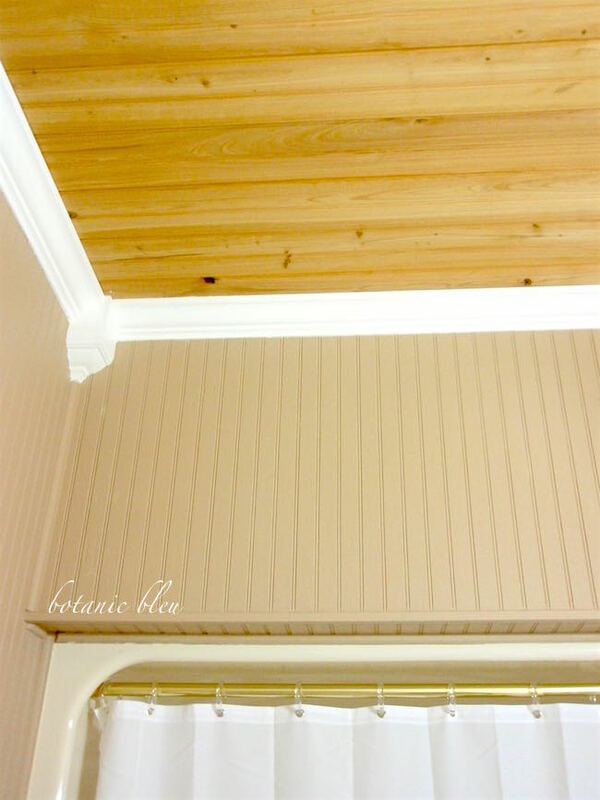 My parents farmhouse ceilings in their kitchen and bathrooms are of beadboard and walls. It really adds so much farmhouse feel to the look. Yours peaking through is enough to wow me, I want to add some shiplap or a vertical look of planks in two rooms of my home. 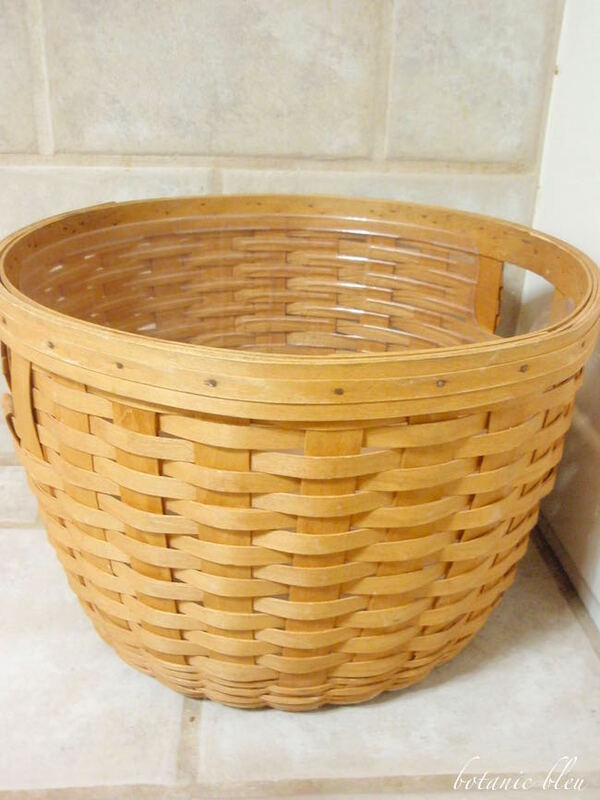 Love your farmhouse print, the fruit basket waste is creative and less mass market look....I have a galvanized bucket in use in my bathroom. Enjoyed all you inspired in your beautiful bathroom home. 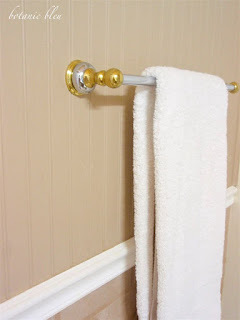 This farmhouse bathroom post is beautiful and very informative. You picked all the right things when you built your house. Beautiful bath! Love the farmhouse style. It's so warm and welcoming! Thanks for sharing with SYC. Judith, Thanks for sharing at Your Inpsired Design Link Party. 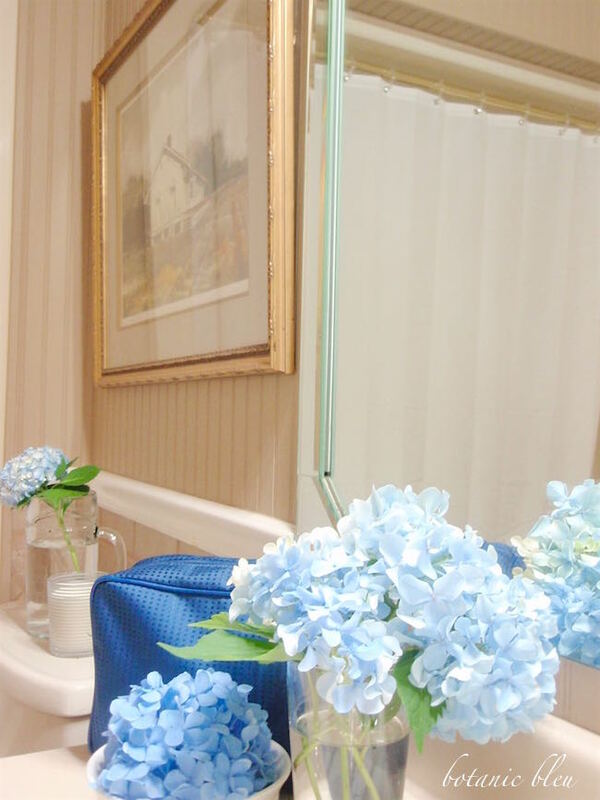 Love how you used blue and beadboard in the bath. 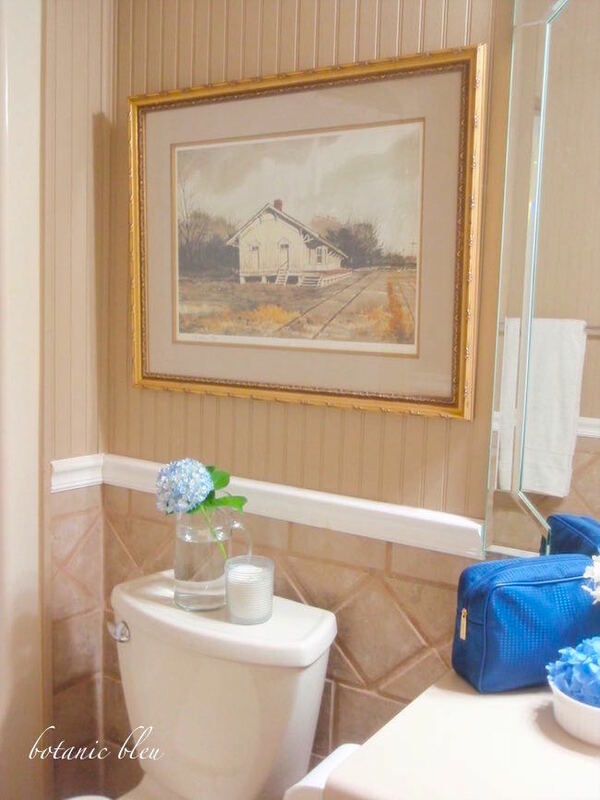 Glad you shared your brothers guest bath in the farmhouse style. Very nice styling especially the fresh beautiful hydrangeas. Lovely! We installed bead board walls in our bath in our first home. I loved the look. Hope you had a delightful 4th of July. Your guest bath is wonderful and I particularly like the woven basket.